Come and Sing with Year 4! 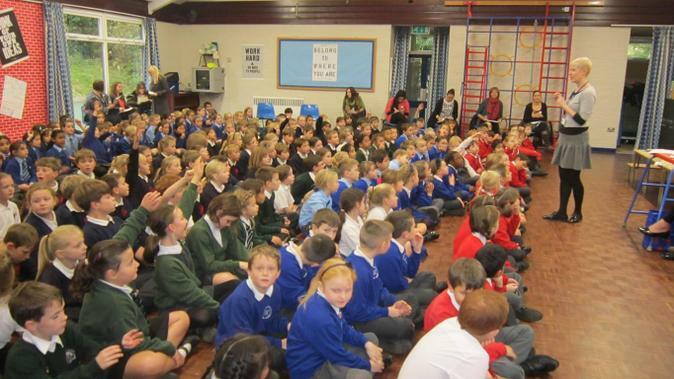 On Thursday 13th November we were joined by loads of other school for a special singing festival. In total there were 253 children. When we got into the hall we did some singing it was great! It loved it. We sang ‘Hannukah’ which was one of the songs. When we had done that we made loads of noise! We were pretending to be fireworks. All the singing was fun but it tired me out! The ladies at the front told us all about the Music Service in Buckinghamshire. You can go there on a Saturday and play an instrument. When we went outside for play we were allowed a biscuit and they were really yummy. In the second half it was even better! It was really fun and the man playing the piano was amazing. So was Mrs Jacob and the other ladies teaching us. Finally we did some more singing warm ups and songs. First the ladies at the front sang it while the man played the piano quietly and then we stood up and sang louder and louder. I had an amazing day!